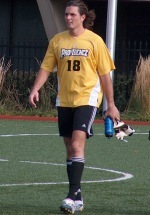 Jersey Shore Boca alum Chris Konopka, who recently ended his college career at Providence College, announced today that he has signed with FIFA Players Agent Patrick McCabe of First Wave Sports Marketing to represent him in pursuing professional soccer opportunities both here in the US and in Europe. He was a member of Boca’s youth system, SYL, U-20, U-23 and PDL teams throughout his career. TOMS RIVER, NJ (November 21, 2006) – With the final whistle in last Friday’s 2006 NCAA Division I Men’s Soccer Championship first round tournament game in Hempstead, Long Island, the college career of senior goalkeeper Chris Konopka (Toms River) came to an end as Hofstra University topped Providence College 2-0 before a record crowd of 1,450 fans at the Hofstra Soccer Stadium. Hofstra moved on to the tournament’s second round while the Friars ended their 2006 season at 13-7-0 and Konopka ended his college career. Although one door has closed on the Jersey Shore Boca alum’s career, another new one has opened as Konopka announced today that he has officially signed with FIFA Players Agent Patrick McCabe, Executive Vice President and Managing Director of First Wave Sports Marketing of Natick, MA, to represent him in pursuing professional soccer opportunities both here in the US and in Europe. First Wave Sports Marketing represents some of the most recognized names in professional soccer both in the US and abroad including the three top, young goalkeepers in Major League Soccer; Brad Guzan of Chivas USA, Troy Perkins of DC United and Matt Pickens of the Chicago Fire. Coaches from Major League Soccer’s Red Bull New York and New England Revolution paid particular attention to Konopka this season as they regularly attended the Friar’s matches. Konopka practiced with the full senior team of Red Bull New York alongside US Soccer goalkeeping icon Tony Meola this summer and spent time during 2005 practicing with both the Revolution and former Metrostars (now Red Bull New York). “Chris had a great college career at Providence. All of us at Boca wish him the very best of success in his future endeavors. We are all very proud of his accomplishments” mentioned Al Schwartz, President of the Jersey Shore Boca Soccer Club which is celebrating its 28-year anniversary in 2006. During his Friar career, Konopka started in 46 of the 49 games he played over his four years at Providence and his 49 game appearances place him third all-time in most games ever played by a Friar goalkeeper. He amassed 4,377 career minutes over four years, allowed 57 goals for a 1.17 career GAA, made 199 career saves, had a career save percentage of 77.7%, recorded 12 career shut-outs and finished with an overall individual record of 18-18-11. The New Jersey native also re-wrote several of the Friar record books during his four years between the Providence pipes. Konopka, a long-time Jersey Shore Boca Soccer Club veteran, was a member of Boca’s youth system, Super Y-League, U-20 and U-23 teams throughout his career as well as a member of Boca’s PDL team in 2003. Boca had over fifty club standouts, including Konopka, who previously played for the Club on either their Men’s, Super Y-League, PDL, Club or Youth teams that were participating in NCAA intercollegiate soccer in 2006 for their respective institutions across the Unites States either as players or coaches.